There are numerous impressive public libraries across the United States in European, most with a fabulous genealogy department. The most outstanding such library is the Family History Library in Salt Lake City, Utah. For every family history researcher they should also know about the Allen County Public Library in Fort Wayne, Indiana. The genealogy department at Allen County Library has an eminent collection with more than 350,000 printed volumes and countless documents, images and records on some 513,000 individual microfilm and microfiche. They also cooperative with the Family History Library to provide on loan from Salt Lake City the 2.4 million rolls of microfilm and microfiche in their collection. One of their biggest contribution for researchers is to be involved in several programs to make a large selection of their collection in public domain become available online. They already have in digital form family histories from ‘Family History Archive,’ Indiana records, state records, African-Americans, military heritage and family bibles data. The family histories contain 50,000 volumes of compiled genealogies on American and European families. The Indian records have marriage, death, cemetery, obituary, courthouse, African-American, firefighters, schools, military, maps, townships records and wills. In the listings for other states, there cemetery and church records for Illinois, Kentucky, Maryland, Michigan, Virginia. Numerous military records and veterans in Wisconsin, New York, Ohio, New Hampshire, Minnesota, Montana, Massachusetts and Illinois. Allen County Library has a complete military heritage section covering every military conflict and war starting during America’s colonial times. There are listings and information on military organizations, yearbooks and burials as well. 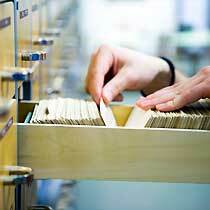 The Genealogy Center offers online the surname file. Here, individual researchers have submitted their name, address, email address and the different surnames they have information on and are interested in connecting with a fellow researcher. The various genealogical materials covering all aspects of the United States and other nations are tremendous especially if you have the opportunity to visit the main Allen County Library in Fort Wayne or its many branches. Those who cannot visit the Genealogy Center in person may need copies from specific sources held by the Center, broader research done in the collection, or copies of articles found by searching the Periodical Source Index (PERSI). The Genealogy Center has a Research Center arm that provides these services. If assistance is needed researchers can use forms on the Center’s website to request copies or research.